Before Jonathan Demme's Academy Award-winning The Silence of the Lambs (1991) graced the screen with Anthony Hopkins in all of his visceral glory, Michael Mann's little-remembered (and seen) thriller, Manhunter (1986), which was released 25 years ago today, presented a very different kind of Hannibal Lecter. While Demme's film opted for over-the-top performances and needlessly gory scenes of violence, Mann's film took a subtler, creepier approach to its material. Manhunter is less interested in depicting the actual killings (the main attraction of this genre when it became popular) than in the cerebral and actual legwork required to enter the killer's frame of mind and track him down. Thomas Harris' novel, Red Dragon, was published in 1981. It explores one man's eerie trip into the mind of a serial killer. Profiler Will Graham (William Petersen) reluctantly comes out of retirement to track down Francis Dollarhyde (Tom Noonan), a man who slaughters whole families to fulfill his own power fantasies. Graham is able to pursue the killer by thinking and dreaming as he imagines the killer does. However, the last time he tried this technique it pushed him to sanity’s edge. The case involved a cunning psychiatrist named Hannibal Lecktor (spelling changed from the novel) who viciously killed his patients, scarring Graham both physically and emotionally. Now Graham must make the dangerous journey back into the mind of a killer to catch him before he kills again. Richard Roth (who produced director Fred Zinnemann's penultimate film, the much-lauded Julia, starring Jane Fonda, in 1977) bought the film rights to Harris' novel for Dino De Laurentiis with David Lynch attached to direct. Lynch already had made the critical and commercial disaster Dune (1984) for the Italian movie mogul and was looking for a chance to redeem himself. "I was involved in that a little bit, until I got sick of it. I was going into a world that was going to be, for me, real, real violent. And completely degenerate. One of those things: No Redeeming Qualities." Lynch went on to make Blue Velvet (1986) and so Roth offered the project to Mann. Although, one wonders what Lynch’s take on the material would have been like. After the failure of The Keep (1983), Mann went back to television and produced the very popular Miami Vice television series for NBC. The 1980s was a time when Ronald Reagan was president of the United States. The country was a consumer culture, a carnivorous, materialistic society that is reflected in the show with its stylish fashion and architecture. Manhunter also is a product of its time as it reflected that era's currency of popular culture in terms of fashion, style and music. Mann read Red Dragon not long after it was published and "thought it was the best thriller I'd ever read, bar none." Mann was intrigued by Harris' exploration into the nature of evil. As Mann wrote the screenplay, he decided not to graphically depict the murders as in the book. This is why Mann's film stands apart from the other Lecter movies and serial killer films in general. The first Mann theme that Manhunter explores is the conflict of the individual versus the desire to preserve their family. Will Graham is a consummate professional and the best at what he does — profiling serial killers. His friend, Jack Crawford (Dennis Farina), seeks him out. Two families have been brutally murdered by the same killer: the Jacobis in Birmingham, Ala., and the Leeds in Atlanta. They talk on the beach in front of Graham's house. Crawford shows Will not pictures of grisly murders as we almost expect, judging from the way they're talking, but snapshots of two families frolicking in a recreational setting. This is quite shrewd on Crawford's part. He is obviously appealing to Graham's protective nature toward his own family. He knows Graham will feel empathy for the dead families and future ones and therefore offer his services. This opening conversation between Graham and Crawford also is a teaser of sorts. Nothing is alluded to concretely — especially Graham's ability to get into the mindset of a killer. The closest we get to what happened to him before he quit is when Crawford says, "You look alright." Graham responds, "I am…alright." That hesitation makes one wonder — is he really OK? How damaged is Graham? What is so fascinating about this scene is that so much is implied. The scene begins mid-conversation and alludes to Graham’s mysterious past, one that has caused an obvious rift between him and Crawford. The audience can only imagine what the source of this tension was and will only learn bits and pieces of what happened to him later on in the film. While Graham keeps in the tradition of Mann’s intensely professional protagonists who are the best at what they do, he is also one of his most layered characters. There is much more to Graham than a driven investigator. He also is an extremely sensitive person who is compelled to do what he does out of a need to save others from being brutally murdered. The process that Graham undergoes to catch these killers is what intrigued Mann in the first place. The visual motif of imprisoning bars features prominently in the scene between Graham and Lecktor (Brian Cox) where the investigator goes to visit the killer in order to get the criminal mindset back. The first shot has Graham framed with bars in front of him. The film cuts to a shot of the imprisoned psychiatrist lying on his bed, his back to Graham with bars in front of him as well. In a way, both men are imprisoned. Lecktor literally and Graham metaphorically, trapped in the nightmare of trying to solve these murders. Graham almost is trapped in his nemesis' presence. Graham does not want to talk too long to Lecktor and risk exposing his mind to the psychiatrist's horrible thoughts. As Hannibal gets up and faces Will, the camera slowly zooms in ever so slightly on him which creates a great dramatic effect. Lecktor resides in an antiseptic white prison cell and he wears white so that he almost blends into his surroundings except for his black hair and the skin color of his face and hands. It is a miniature disturbance in this immaculate and pristine place that effectively conveys how dangerous Lecktor is: those tiny bits of him are already disruptive to the immaculate white of the scene. It also throws everything off just ever so slightly as the focus is directly on Hannibal's face, forcing the audience to pay attention to what he is saying and how he is saying it. Even though imprisoned, he seems very clearly in control. The two men engage in a verbal dogfight as Lecktor tries to push Graham over the edge, while Graham fights being exposed to the madness. The speed of this little exchange is like some kind of perverse screwball comedy. Cox is so effective by the way he underplays it: completely calm, yet always just a tad menacing — be it the affectations of his accent or the quiet and ruthless way he gives his lines an off-center spin. Lecktor does not go for the easy insult and counters, "You're very tan, Will," and proceeds to analyze him, demonstrating how easily he can pick him apart. Then, Hannibal goes in for the kill when he says, "Dream much, Will?" At this point, Graham has had it and gets up to leave. He cannot let Lecktor invade his thoughts or his dreams. In Mann's world,j this would be fatal. Finally, it gets to be too much for Graham as Lecktor presses his advantage: “You know how you caught me, Will? You know how you caught me? The reason you caught me, Will, is because we're just alike. You want the scent? (quieter, menacing) Smell yourself.” Lecktor starts off speaking quietly yet insistently. Graham can no longer stand it and begins pounding on the door, demanding to get out. Lecktor continues, increasing the volume of his voice until Graham, frantic at this point, runs out of the building. As Lecktor says this last line his voice dips to a threatening whisper. Graham runs down the many corridors of the psychiatric hospital, almost as if he is symbolically escaping Lecktor's brain, his cell being the vortex or center of it. The scenes that take place at the Chesapeake State Hospital for the Criminally Insane were shot at the High Museum of Art in Atlanta while the scenes in Lecktor’s cell were shot on a soundstage in Wilmington, N.C. According to Cox, he and Petersen rehearsed this scene for 10 days and shot it during a period of four days. Not surprisingly, Mann shot the scene many different ways. "At one point," Cox remembers, "I screamed the line 'Smell yourself.' At another, I did it very quietly. I did it every way imaginable." Cox plays Lecktor as a polite man, but you can sense the menace seething underneath the cheery facade. He delights in probing Graham's mind, threatening to invade his thoughts and his dreams. Another of Mann's preoccupations is showing the process of professionals hard at work, doing what they do best. This is showcased prominently in the scene where Graham and Crawford analyze Dollarhyde’s note to Lecktor. While cleaning Hannibal’s cell one day, a janitor finds the note addressed to the psychiatrist. Lecktor is taken out of his cell, giving the investigators just a few hours to decipher the note before Lecktor gets suspicious. First, the hair fibers are analyzed; second, the note is analyzed for fingerprints; third, they try to figure out what the missing section of the note says; and finally, they try to decipher Hannibal's reply in the National Tattler personal ads. Mann is meticulous in how he shows the hard work that these professionals do as they analyze physical evidence with state-of-the-art science and technology at their disposal. Everybody works and communicates together as a team racing against time. As a result, there is a believable tension between the haste of beating the clock and the patience Crawford and Graham exert as they supervise their expert forensic team. 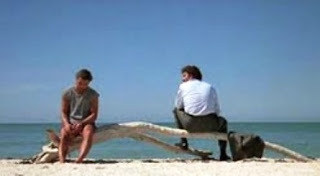 Another stand-out scene is one where Graham decides to deal with the rift that has been created between him and his family by talking with his son. The scene between them features some of Mann's best writing. Fascinating insight into Graham's past and his special ability are discussed in detail. It also is a nice scene between a father and his son. It takes place in an everyday setting — a grocery store — but they are talking about extraordinary things. Kevin tries to understand what his father does and Graham explains how he caught Lecktor: "I tried to build feelings in my imagination the killer had so that I would know why he did what he did." They also talk about how catching Lecktor affected him. This scene beautifully underlines the danger that Graham faces. He runs the risk of hurting himself physically and mentally again. It also shows that he is able to compartmentalize his thoughts and his feelings. He recognizes that the thoughts of killing and hurting people are wrong where Lecktor and Dollarhyde do not and that is what separates Graham from them. This exchange is fascinating because we learn more about the internal struggle that exists within Graham and how much of a threat it is to his well-being. Graham and his son have a heartfelt talk about madness which is contrasted by their banal surroundings: brand name consumer goods. This nicely foreshadows what eventually happened to the serial killer genre: in the 1990s: It became riddled with cliches and stereotypes (i.e. the "normality" of the serial killer who is a symptom of our consumer culture). At the time that Manhunter was made, the genre was still quite fresh and new. Terms such as "profiler" and "serial killer" were not as commonplace. The scene ends with a final shot of Graham and Kevin, his arm draped protectively around his son's shoulder, heading to the checkout. Most importantly, this scene demonstrates that Lecktor was not successful in splitting up Graham and his family because they were able to communicate and talk to each other about their feelings. Mann also provides insight into Francis Dollarhyde's day-to-day existence. This is an attempt to humanize the killer. He is not just some faceless, inhuman maniac or an obvious caricature a la Buffalo Bill in The Silence of the Lambs. Dollarhyde works at a photo developing lab. We see him walk into a room and look intensely at a photo of what will be the next family that he will kill. As he stands up, he rubs the sides of his head and looks up. We can see a shift in his facial expression — he has gone from being Dollarhyde to the Red Dragon, his murderous persona. The way Tom Noonan plays this scene is excellent and understated. He effectively conveys the sudden shift of personalities in Dollarhyde. Mann goes to great lengths to make Dollarhyde more humane in the sequence where he and Reba (Joan Allen), a woman from work with whom he becomes romantically linked, lie in bed together after making love. He rests his head on her chest almost as a child would and much in the same way she did in an earlier scene with a tiger. She rolls over and puts her hand on his chest but he places it on his mouth. The camera zooms in and his expression transforms into one of sadness as he starts to cry. There is this realization that buried beneath those frightening eyes is a scared, abused child. The Red Dragon persona has not completely taken over. All that Dollarhyde really wants is what most people want: to be loved and needed. He has found this with Reba. Noonan's performance in this sequence is a revelation. He uses his big, awkward-looking body to menacing effect but is as sad as he is deadly in a child-like, almost uncomprehending way. With his very expressive face, Noonan conveys the tortured soul buried deep within and this brings a sense of humanity to his character. Mann's theory on why a killer such as Dollarhyde does what he does is revealed in a great phone conversation between Lecktor and Graham. The first shot of Hannibal shows him lounging in his cell, his feet up like he is talking to an old friend. It is amusing because here is this very dangerous psychopath being completely casual. Lecktor unwittingly provides Graham with the key to understanding Dollarhyde, thereby allowing the investigator to find him. Lecktor explains why killing feels so good. "God has power. And if one does what God does enough times, one will become as God is." As Lecktor rambles on about what "a champ" God is, Graham is not even listening to him anymore. He has found the key to understanding Dollarhyde and he does not need Lecktor anymore. At this point it becomes readily apparent what Graham meant early on in the film when he said that Lecktor had "disadvantages." This is what allows Graham to finally surpass him. Not everyone appreciated Mann's approach to filmmaking. Many crew members were stressed out from a grueling and intense shooting schedule. This was only exacerbated by De Laurentiis having financial trouble at the time and as a result the production was running out of money. They were forced to shorten their shooting schedule, which meant that the film’s exciting showdown between Dollarhyde and Graham would have to be shot in only one or two days. The special effects team quit prior to the filming of the scene. The gunshot effects, as Dollarhyde is killed by Graham, were done by Mann himself. The entire confrontation was shot in one day over three-and-a-half hours. Mann remembers that they were shooting so fast it felt as if they filmed the scene in real time. Harris' novel was named after poet/artist William Blake's famous painting, "The Great Red Dragon and the Woman Clothed with the Rays of the Sun." Mann kept the name “Red Dragon” for the film right up to its release. The title was changed to Manhunter so that, according to Mann, the audience would not mistake it for a kung fu film. The "Manhunter" moniker came from a headline on the Tattler newspaper in the film. The cruel irony is that this change in name did nothing to help the film at the box office. Manhunter grossed $2.2 million on its opening weekend. It went on to make $8.62 million in North America. In retrospect, Mann feels that "the project was probably doomed commercially from the outset." At the time, Harris had only written Black Sunday and was not the big name he is now. The movie's title still is a sore point for the director. "The film's backers all said, 'Red Dragon? It sounds like a Chinese movie. Who cares about kung fu movies? '…Manhunter was a compromise title and a bit too much in the mode of generic police thrillers." Mann’s film was dumped into cinematic limbo after the De Laurentiis Entertainment Group declared bankruptcy. However, Manhunter survived on video and cable television. With the film’s commercial failure, Mann returned to television and continued to executive produce Miami Vice and a new television series, Crime Story. In a few short years, Crime Story was canceled after only two seasons and Miami Vice ended its lengthy run soon afterward. He would not make another feature film until six years later. I've always liked this movie, and it's good to re-watch the film after viewing "Silence of the Lambs" and "Red Dragon". All three are excellent and stand on their own.